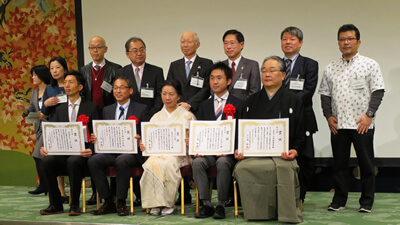 On March 27th of 2017, WAK JAPAN Co. was awarded the grand prize of “The 1st Hanayaka Kansai Miryoku Upward Award” from Hanayaka Kansai Forum, appreciating the WAK JAPAN’s project “Raising the Kyoto value for overseas wealthy class visitors and Providing the activity of traditional culture”. *Hanayaka Kansai is the concept to promote the attractiveness of entire Kansai region organized by Kansai Economic Federation and Union of Kansai Governments. 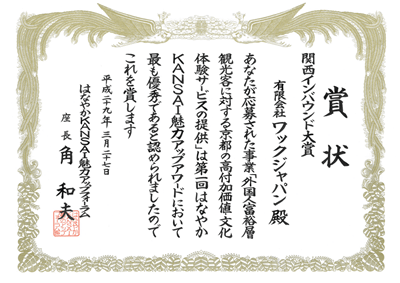 It aims to enhance the level of recognition of Kansai among tourists both inside and outside Japan.